According to the Bureau of Labor Statistics, there are more than 356,000 pharmacy technicians working in hospitals and independent retail chains across the nation. Outside of traditional pharmacies, technicians also work in long term care facilities, insurance companies, government agencies and pharmaceutical companies. Demand for pharmacy technicians is high and is expected to increase by 20% by the year 2018. New drug treatments, the aging population, and affordable health care covered by insurance help fuel the growth in this particular sector. As of 2012, the median pay rate for pharmacy technicians is $29,320 per year or $14.10 per hour, which makes it an attractive profession for many individuals. The Illinois Department of Financial and Professional Regulation (IDFPR) regulates the profession of pharmacy technicians in Illinois. The Department requires technicians to complete accredited training, pass a recognized exam, and register with the state. Pharmacy technicians should also have excellent communication skills and a compassionate nature to support patients who may not be in the best of health. 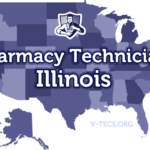 All pharmacy technicians working in Illinois pharmacies must first apply for registration with the Illinois Department of Financial & Professional Regulation. According to the Pharmacy Practice Act, a pharmacy technician is any person employed by a pharmacy who performs non-discretionary functions associated with the practice of pharmacy. The pharmacy technician also performs other duties subject to the restrictions of the IDFPR and under the supervision of a licensed pharmacist. Once registered, the IDFPR will issue a registration certificate, which must be on display and visible to the public at the technician’s place of work. Applicants for registration should file a completed application with the Department along with proof of high school graduation or equivalent and the application fee. The Pharmacy Act allows applicants for registration to assist a registered pharmacist for a period of 60 days after submitting the application for registration. 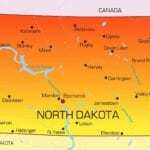 Applicants for reinstatement of a license can also work for a 60-day period as long as there are no instances of disciplinary actions taken against the applicant. During the 60-day allowance, applicants must maintain a copy of the application at the employment site and must be readily available for review by the Drug Compliance Investigator. Pharmacists with revoked, denied, restricted and suspended licenses are not eligible for registration as pharmacy technicians. Applicants must be at least 16 years old to register as a pharmacy technician in Illinois. Pharmacy technicians registering for Certified designation must be at least 18 years old. A statement from the school printed on an official letterhead. All applicants must demonstrate good moral character, which the Department will determine, based on your response to the Personal History section on the application form. Applicants for Certified designation must provide proof of completing a pharmacy technician training program from an accredited institution. The Department will also accept employer-based training provided by a pharmacist –in-charge. Claims of employer-based training must be supported by accompanying documentation. Pharmacy technicians must also successfully pass an accredited examination in order to qualify for registration as Certified Pharmacy Technicians. Department-approved assessments are those administered by the Pharmacy Technician Certification Board and the Institute for the Certification of Pharmacy Technicians. Pharmacy technicians have up to two years, after registration, to pass the exam and update the license. The comprehensive pharmacy technician training programs at Illinois accredited institutes equips students with theoretical knowledge and practical skills to enter the workplace as entry-level employees. A combination of classroom instruction and hands-on externship help students develop in all aspects of pharmacy practice, including pharmaceutical calculations, computer entry, compounding aseptic and extemporaneous products, communicating with customers and presenting a professional manner at all times. Other topics include drug class differentiation, drug interactions, pharmacy law and ethics, basic anatomy and physiology, and pharmacokinetics. In addition to the coursework, students earn hands-on experience through a clinical externship. Some schools require students to complete an equal number of hours in a community and hospital pharmacy. 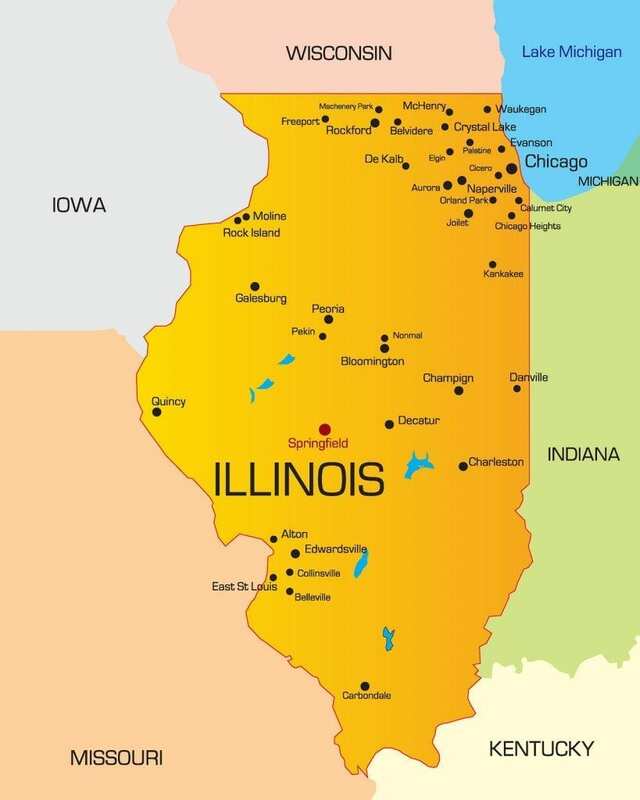 Illinois requires pharmacy technicians to obtain a license prior to working. Therefore, students will need to apply for a license and complete a criminal background check, drug screen and obtain all required immunizations prior to the externship. Accredited programs meet the IDFPR requirements and prepare students for success on the PTCB or ExCPT exams. The average cost of pharmacy technician training in Illinois is $1,250. Colleges and technical institutes outnumber the other traditional training providers by far. 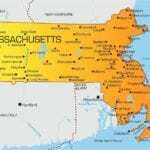 However, there’s a mass number of employer-based programs provided by the state’s recognized pharmacies. Students who opt for in-house training at their place of employment, must apply for a license and can work for a duration of 60 hours while the Department processes the application. Apart from the benefit of free training, employer-based programs also give students the chance to learn directly from a licensed pharmacist in a real-world setting. Financial aid may be available to help cover the cost of tuition at colleges and vocational schools. Remember, advertised costs may not cover essential expenses, such as textbooks, workbook, pharmacy technician certification or other assessment exams, immunization, background check, uniform and other costs. The average program covers 120 training hours, which students can complete in 3 to 8 weeks. Illinois is one of a few states that give pharmacy technicians the choice of certification exams. The IDFPR accepts two leading exams to satisfy the candidates’ need for certification. Illinois techs can take either the PTCB exam or the ExCPT, developed by the Institute for the Certification of Pharmacy Technicians (ICPT). The PTCB is a older of the two assessments specifically designed for pharmacy technicians. More than 26 states require technicians to obtain PTCB certification, and pharmacy employers, almost always, expect PTCB certification from their pharmacy tech employees. The exam is available at more than 350 Pearson Vue testing centers nationwide. The PTCB application is available online. Candidates must provide proof of high school graduation and pass a criminal background check to qualify. The application fee is $129. Once the PTCB approves the request, candidates must schedule a test date within 90 days at the center of their choice. The computer-based exam contains 90 questions, which students must complete in two hours. The ExCPT offers test dates throughout the year at more than 1,000 computerized testing centers across the nation. Applicants can schedule a test date within 48 hours of registration. Applicants must possess a high school diploma or GED equivalent and pay the $105 exam fee to register. The two-hour exam contains 110 multiple-choice questions. Pharmacy technicians (or students) can apply for registration with the Illinois Department of Financial & Professional Regulation using the instructions provided below. All registered pharmacy technicians must request the designation as a Student or Certified pharmacy technician with the application or renewal form. Fill out the application for registration making sure to provide accurate information. Provide copies of your ID and social security card. Provide a copy of your high school transcript, diploma, statement from the school or GED certificate. Enclose the $40 application fee using a check or money order – make payable to the Department of Financial and Professional Regulation. Include proof of legal name change if applicable. Applicants for Certified Pharmacy Technician designation will need to submit proof of graduation from an approved pharmacy technician training program and proof of certification from the ICPT or PTCB. Student pharmacy technicians must submit proof of enrollment in an accredited School of Pharmacy. If you answer “yes” to the Personal History questions, you must provide supporting court documents. Sign and date the application and mail to the address provided below. Pharmacy technicians must renew their registration with the Department annually. The registration expires on March 31 every year. All licenses must have the Student or Certified designation by the second renewal. It is the pharmacy technician’s responsibility to inform the Department of any name or address changes within 30 days of making the change. The Department will mail the renewal application 30-45 days before the license expires. Provide supporting documents via mail if your name or address changes. If you do not have to make changes, you can renew your application online using a Visa, MasterCard or Discover Card. You can provide your license number and social security number to print a renewal application online if you do not receive one by mail. If you need to add your Student or Certified designation with the renewal, you should provide the documents outlined in the renewal requirements form. Pharmacy technicians who are registered in another state must apply for registration with the Department before working in the state’s pharmacies. The technician will need to fill out the application form and provide the supporting documents, including previous training and certification to the licensing authority.